This article provides in-depth fundamental analysis of Jenburkt Pharmaceuticals Limited (Jenburkt Pharma), an Indian pharmaceutical player. I have done an analysis of Jenburkt Pharma. Need your advice on the same. So kindly look into it and provide your valuable advice. 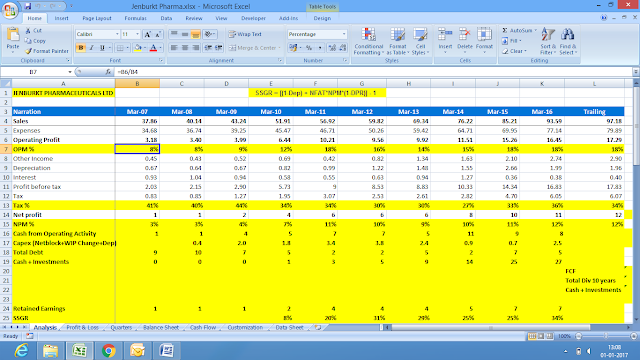 Let us analyze the financial performance of Jenburkt Pharma over last 10 years. Jenburkt Pharma has been growing its sales at a pace of 10-11% over last 10 years (FY2007-16). However, as can be seen, there are wide fluctuations in YOY sales growth ranging from 5%-20%. 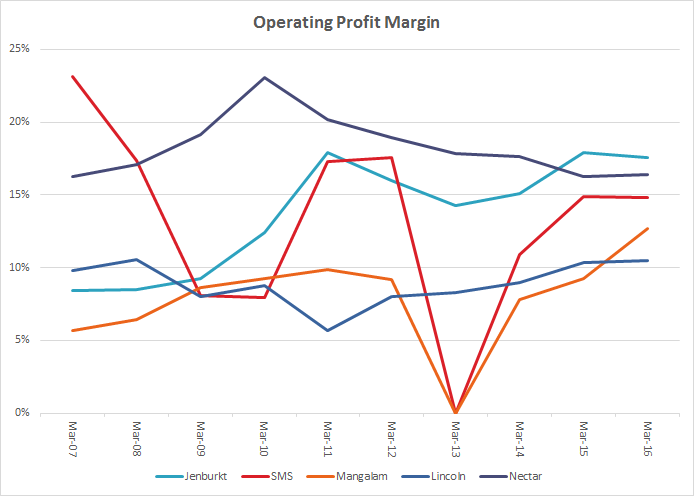 A look at the profitability trend of Jenburkt Pharma would indicate that the both the operating profitability margin (OPM) has been highly fluctuating over the years. OPM has been varying from 8% in FY2007 to 18% in FY2011 and then falling to 14% in FY2014 and currently improving to 18% in FY2015 and FY2016. Similarly, NPM has been witnessing wide fluctuations from 3% to 11% in the past and currently hovering around 12% in FY2015 and FY2016. The management of Jenburkt Pharma has communicated the same to its shareholders in the FY2013 annual report. Few products of the Company are under DPCO, which has a ceiling on the maximum retail price and there are constant changes in the regulating framework for approval of new products in India. The Company has to increase more and more expenditures, in order to constantly be at par with international standards of manufacturing. Increasing raw material costs and increase in fuel price affect margins of the company. In addition to that, the cost of material, plant and product registration in various countries, expenditures on R&D activities and on the modernization of the plant, constant increase in fuel price resulting in higher inputs, increase in excise duty and stiff competition has also put substantial pressure on the profit margin of the Company. The Company has to increase more and more expenditures, in order to constantly be at par with international standards of manufacturing. Further, being in the knowledge industry, there is a constant need to match industry standards for employee compensation. The increase in operating profitability margins of Jenburkt Pharma in recent years can easily be attributed to the decline in fuel oil prices in last 1.5-2 years and the margins may decline in future if the fuel prices increase. Jenburkt Pharma has been witnessing tax payout ratio within a healthy range of 30-36% except for one exceptional year of FY2014 in which it was 27%. Overall there does not seem to be any concern in respect of tax payout ratio which is a good sign. Looking at the net fixed asset turnover (NFAT) of Jenburkt Pharma over the years, an investor would notice that its net fixed assets turnover (NFAT) has been fluctuating more or less in the range of 5%-8% which is evident from fluctuating sales growth pattern of the company. Since the company operates in the knowledge industry, the impact of an increase in Employee cost and R&D cost needs to be considered while evaluating NFAT. Similarly, when an investor assesses the inventory turnover of Jenburkt Pharma, then the investor notices that the inventory turnover of Jenburkt Pharma has improved over the years from 6 in FY2007 to 12 in FY2016. Such an improvement in the inventory turnover is a significant achievement for the company as it leads to relatively lower working capital costs for the company as the relatively lower amount of funds remains blocked in the form of inventory. Receivables days of Jenburkt Pharma have been reduced from 46 days in FY2007 to 26 days in FY2016 and it can be seen that they are stabilized in the range of 26-28 days in last 7 years which is a good sign. The certainty of receivable days helps a company in managing its cash flows in a better way and help company determining its short-term cash requirements. Over last 10 years (FY2007-16), Jenburkt Pharma has been able to convert its profits into cash flow from operations. Cumulative PAT during FY2007-16 is ₹54 cr. whereas the cumulative cash flow from operations (CFO) over the similar period has been ₹58 cr. The Self-Sustainable Growth Rate (SSGR) of Jenburkt Pharma over the last 5 years is about 25-30%. Analysis of SSGR indicates that if Jenburkt Pharma can manage its working capital management and operating efficiency properly, then it can grow continuously at about 25-30% growth rate without creating an additional debt burden on the balance sheet. As Jenburkt Pharma has been growing at a rate of 10-11%, it has been able to manage its growth story without leveraging its balance sheet. At March 31, 2016, Jenburkt Pharma has a short-term debt of about ₹5 cr. on its books, which consists short-term working capital facilities that are required for day to day operations of a company. These findings of SSGR get re-affirmed when an investor analyses the cash flow from operations (CFO) of Jenburkt Pharma with its capital expenditure (Capex) requirements over last 10 years (FY2007-16). During FY2007-16, Jenburkt Pharma realized total CFO of ₹58 cr. and out of it, it needed to spend ₹18 cr. into capital expenditure, thereby releasing free cash flow (FCF) of ₹40 cr. as surplus for shareholders. The investors would agree that a company which generates good amount of free cash flow (FCF) post meeting entire capex requirement from its operating cash flow (CFO) would not need any debt or equity dilution. The same is true for Jenburkt Pharma; it has maintained Debt to Equity ratio of 0.15-0.20 in last 5-6 years. All the debt of Jenburkt Pharma is short term working capital debt. This data indicates that Jenburkt Pharma has used its capital efficiently. Despite meeting its entire capex requirements, Jenburkt Pharma was able to generate FCF of ₹40 cr. out of which it distributed ₹17 cr. as a dividend to shareholders (excluding dividend distribution tax) over last 10 years (FY2007-16) and it is having remainder as the cash balance in the Balance Sheet. Higher SSGR and positive free cash flow indicate the presence of a margin of safety in the business model of the company. As can be seen, in last 10 years, the company has made total capex of Rs. 18 Cr and sales growth has remained modest around 10%-11% whereas SSGR of the company is around 25%-30%. This reflects the conservative approach of the management. This gets reaffirmed when one notices cash position in the Balance Sheet of the company. The company is holding cash and cash equivalents of Rs. 29.63 cr as on 31st March 2016 which is well beyond total capex made by the company in last years. The Company had mentioned in its Annual Report of FY2015 that it yet to reach to its optimum manufacturing capacity. While analysing combined impact of a conservative approach, having huge cash in Balance Sheet and not reaching optimum manufacturing capacity, one may conclude that the company may not do huge capex in near future and if capex is needed it can easily fund from its cash balance. Thereby, it may not need additional outside long term debt which will not put a strain on the Balance Sheet. The total remuneration of the directors of Jenburkt Pharma (₹1.21 cr) is about 10% of PAT for FY2016 (₹12 cr). The remuneration of 10% of the PAT is on a higher side. Jenburkt Pharma has been paying a regular dividend every year in last 10 years. Contingent Liability of Rs. 16.45 crore if materialized may wipe out an entire year’s profit. As per Annual Report for FY2015, the company entered into a lease contract with Bhuta Holdings Pvt. Ltd (a Private Company in which directors of the Company are director/member) for a duration of 5 years. The annual rent as per FY2016 is Rs. 48 lacs which is about 4% of the net profit of the company. Related party transactions where a company pays rent or consulting charges to the relatives of the promoter are always grey areas. This is because it can easily be a method to take funds out of the company for the benefit of the promoter/family members. An investor needs to keep a close watch on the rent figure in future years. As per Annual Report of FY 2016, Promoter holding is 46.35%. Jenburkt Pharma is currently available at a P/E ratio of about 20, which does not provide any margin of safety in the purchase price as described by Benjamin Graham in his book The Intelligent Investor. There are many issues related to the company’s business operations like lack of pricing power and the management aspects like high remunerations and related party transactions, which would always influence the price multiples that the markets would assign to any company. Overall, Jenburkt Pharma seems to be a company, which has been growing its sales at a moderate pace with fluctuating operating margins indicating low supplier’s power over its buyers. The recent increase in profitability seems more due to the fall in commodity raw material prices and it remains to be seen, whether the improving margins remain sustainable in future. An investor should monitor the impact of higher fuel prices on the operating margins of the company. The inherent business model of the company has enabled the company to achieve its growth with limited capex leading to good cash flow position. An investor should keep a close watch on the related party transactions going ahead and should also keep in mind the contingent liability of 16.45 crore which if materialized may wipe out one year’s profit. Many thanks for sharing your analysis of Jenburkt Pharma with the readers and the author. We appreciate the time & effort put in by you in the analysis and making it available to the wide audience. It is pleasing to witness the manner in which you have identified the structure of various analysis articles at our website and used the same to analyse Jenburkt Pharma. We are happy to see that the article structure has been a help in covering most of the key aspects of analysis of Jenburkt Pharma. We appreciate that you have read both for latest and previous years’ annual reports of the company and have highlighted key points and concerns. The amount of effort put into the analysis including the comparison of annual reports of the company with its peers is clearly visible. Your hard work would prove helpful to any investor who might be thinking about analysing annual reports of the company. It has been rightly mentioned by you that Jenburkt Pharma has been witnessing moderate sales growth of about 10-11% over the years, which has seen fluctuations year on year. The same trend is observed in its profitability margins, where both operating profitability margin, as well as net profit margin, have witnessed fluctuations year on year. However, looking at the trend of profitability margins and upon comparison with similarly place peers, it does not look like that the company does not have any power to maintain its profitability margins. 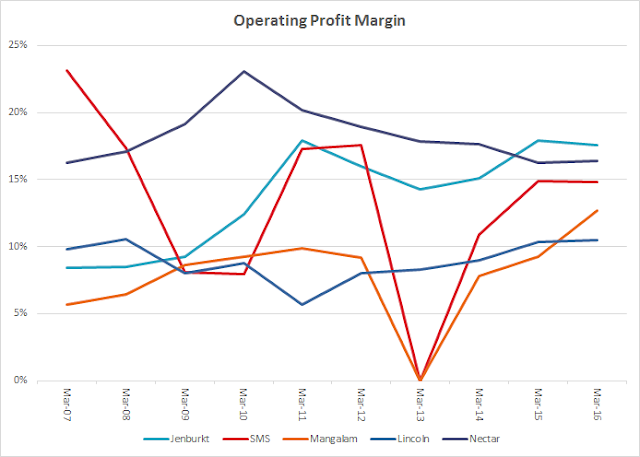 The below chart compares the profitability margins of Jenburkt Pharma with similarly placed peers like SMS Pharmaceuticals Limited (M-Cap: ₹770 cr), Mangalam Drugs & Organics Limited (M-Cap: ₹230 cr), Lincoln Pharmaceuticals Limited (M-Cap: ₹400 cr) and Nectar Lifescience Limited (M-Cap: ₹825 cr). The comparison clearly indicates that Jenburkt Pharma has been able to perform better than most of its similar-sized peers and has been able to improve its profitability margin over the years from 8% in FY2007 to 18% in FY2016. On the contrary, peers like SMS Pharmaceuticals Limited and Mangalam Drugs & Organics Limited have seen very wide fluctuations in the operating profitability margins to the extent that in FY2013, both these companies reported operating losses. Therefore, we believe that the company has been designing its products/market profile as well as negotiating with the customers in a way, which is resulting in the improving operating margins over the years. It remains to be seen whether Jenburkt Pharma would be able to maintain such long-term trend of improving margins in future. Selling and administration costs 28% of TOI: ₹26 cr. Moreover, the fuel costs of ₹0.57 cr. are very minuscule part of the total expense and therefore, does not seem to be very material to impact profitability margins in a huge manner. The key factors determining the costing or in turn operating margins of the company would be its raw material costs, employee costs (which are very high in comparison to the industry) and the selling & administration costs. An investor should monitor these expenses going ahead. As rightly mentioned by you, Jenburkt Pharma seems to be paying its taxes regularly and at the standard corporate tax rate, which is a good sign. On the operating efficiency parameters as well, Jenburkt Pharma has been doing good with each of the parameters of net fixed assets turnover, receivables days as well as inventory turnover ratio witnessing improvements over last 10 years. We agree with your findings that Jenburkt Pharma has a good Self-Sustainable Growth Rate (SSGR) of 25%-35%, which is more that the growth rate being achieved by it. As a result, the company seems to have grown well from sales of ₹38cr. in FY2007 to ₹94 cr in FY2016 without getting into debt burden. On the contrary, it has reduced its total debt from ₹9cr in FY2007 to ₹5 cr in FY2016. 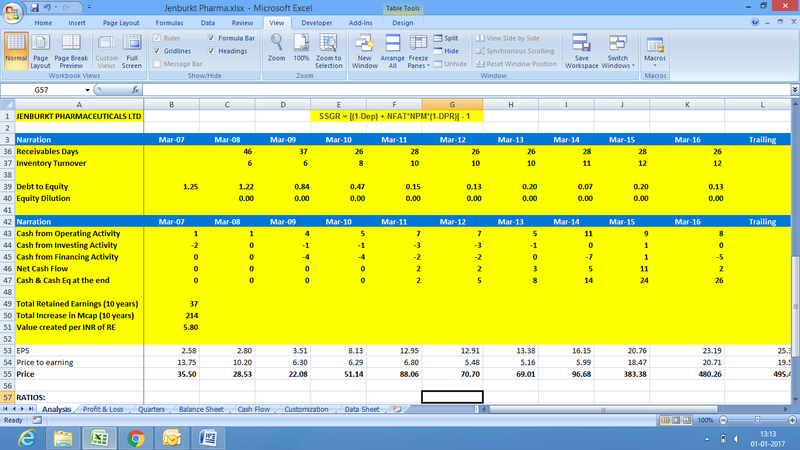 You have rightly pointed out that when we analyse free cash flow generation, then the company scores well. Healthy cash flow generation, good working capital management and efficient assets utilization have ensured that Jenburkt Pharma has been able to accumulate cash & investments worth of about ₹30 cr after meeting all the capex needs as well as dividend payouts. 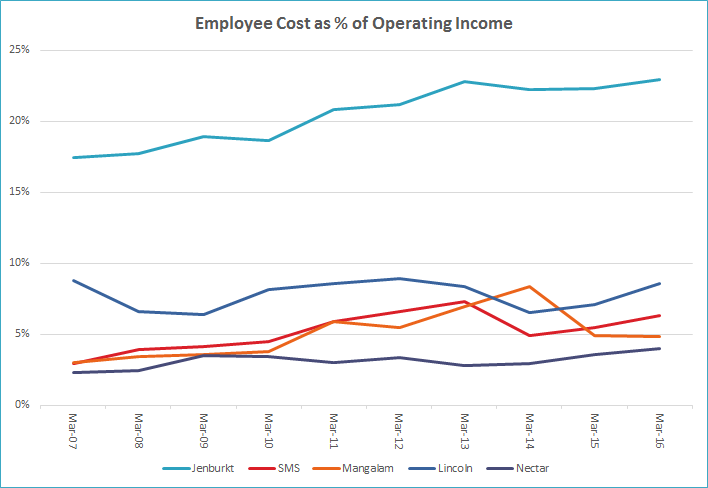 When we compare the employee costs as a percentage of total operating income of Jenburkt Pharma with its above-mentioned similar-sized peers, then we notice that the employee costs of Jenburkt Pharma are disproportionately high. 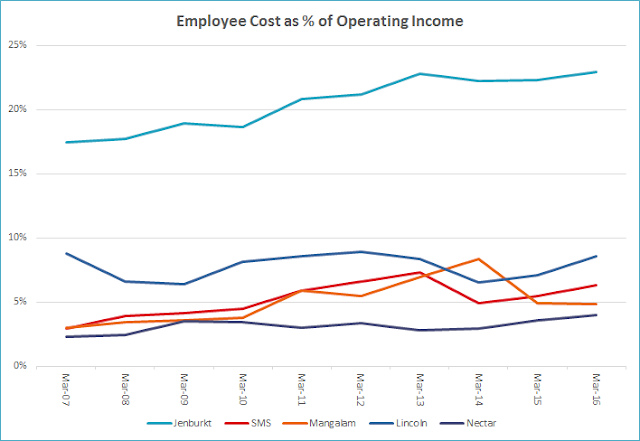 The above chart indicates that the employee costs of Jenburkt Pharma at 23% of operating income in FY2016 are about 2.5 times of the nearest peer (Lincoln Pharmaceuticals Limited: 9%) and about 6 times of Nectar Lifescience Limited (4%). The argument that the higher employee costs of Jenburkt Pharma might be the reason for its healthy operating margins (OPM: 18%) as the good employees lead to good products/marketing and in turn good margins, does not hold well. This is because of the peer, Nectar Lifescience Limited, which has almost similar OPM: 16% has the lowest employee costs at 4% of the total operating income. Moreover, an investor would also notice that the remuneration of chairman & managing director (CMD) of Jenburkt Pharma, Mr. Ashish U. Bhuta for FY2016 is ₹0.96 cr, which is about 8.7% of the net profit after tax (PAT) of the company for FY2016 (₹11cr). The remuneration of promoter director at 8.7% of PAT is on the higher side. We have noticed that in most of the cases, the remuneration of promoter directors is about 2.5 to 4% of PAT, which includes the commission of about 2% on the profits of their companies. Upon reading the annual report for FY2016 of Jenburkt Pharma, an investor would notice that the remuneration of the promoter/CMD for FY2016 does not include the variable component, which in most cases is the commission on the profits. An investor would notice that the commission terms assigned by Jenburkt Pharma to the promoter/CMD is 3%, which is higher than the normal industry levels. This assumes further significance in the light that the current remuneration of 8.7% of net PAT is without any commission. Therefore, as rightly pointed by you, an investor needs to keep a track of the managerial remuneration of the promoter directors at Jenburkt Pharma. Jenburkt Pharma has been facing a litigation with the drug pricing regulator asking for a penalty of ₹16.45 cr. from the company for alleged violation of its orders. The case has been settled in the favour of the company in the High Court and currently, the appeal is pending in the Hon. Supreme Court of India. You are right that the amount of ₹16.45 cr. is higher than the annual profits of the company and therefore, if the case is settled against the company, then it would wipe out profits of a year. However, looking at the current cash position of the company, as it has about ₹25 cr. in bank fixed deposits, it does not seem to risk the viability of the company. However, an investor needs to keep a track on the progress of the litigation in the Hon. Supreme Court of India. The shareholding of the promoters at December 2016 is 45.81%, which has seen an increase from the shareholding level of 43.94% in September 2010. So overall it seems that the promoters are comfortable at this level of shareholding and are able to execute their plans comfortably. It might be that other key shareholders, which, currently, are not included in promoters’ shareholding, might be people close to management and therefore, the promoters are comfortable maintaining a shareholding below 50%. An assessment of the related party transactions section of the FY2016 annual report of Jenburkt Pharma indicates that the company does not have a lot of transactions within the group apart from a leave & license arrangement with Bhuta Holding Pvt. Ltd., which is also one of the major shareholders of Jenburkt Pharma. The rent being paid to Bhuta Holding Pvt. Ltd by the company has been increased by 27% in FY2016 to ₹48 lac from ₹37.8 lac in FY2015. The increase in rent by 27% seems high from market benchmarks perspective. Usually the rentals in commercial spaces/retail malls witness increases of usually 4%-5% each year or about 12%-15% every three years. An investor may do further assessment of the property, which has been taken on rent by the company and the market rental in the locality. The investor may get the details of the property being taken on rent by the company from the investors’ contact of the company/company secretary. As per the FY2016 annual report, page 50, Jenburkt Pharma has disclosed that it has purchased finished goods worth of ₹22 cr. It is expected that if the company has purchased goods in ready to sell condition from vendors and sold it into the market, then it should show it as trading activity. Assuming that entire finished goods of ₹22 cr. were sold in the current year, then the trading activity would have at least contributed 23% (22/94) of sales. By this assessment, the company should provide details of trading activity as a separate business segment. However, the important aspect to note here is that the company is giving away its profitability margins by sourcing finished goods from the third party. An investor should assess whether the third party from which the finished goods are sourced is a related party, which has not been disclosed in the annual report. Such assessment becomes necessary as such arrangements are one of the tools to divert profits from one corporate entity to another entity at the cost of shareholders. When an investor analyses the FY2016 annual report, page 47, then she would notice that the data presented in the short term provisions has issues. The data for FY2016 is not getting reconciled when the reader totals the items. Similarly, the data for FY2015 has one key element “provisions for income tax” of ₹5.15 cr. wrongly placed under FY2016. An investor should get clarification from the company about the data of the short-term provisions. We agree with your assessment that at the current P/E ratio being above 20, the share price of Jenburkt Pharma does not offer any margin of safety in the purchase price. 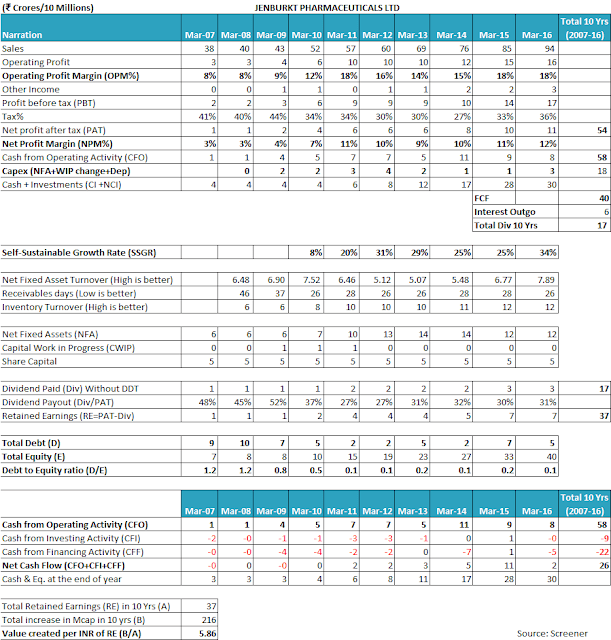 However, if an investor focuses on the business aspect of the margin of safety by analysing the self-sustainable growth rate (SSGR) and free cash flow (FCF) generation, then she would notice that Jenburkt Pharma has a good margin of safety in its business model. Therefore, we would recommend that the investor should factor the margin of safety in the business model as well while making an opinion about the available share price of Jenburkt Pharma. 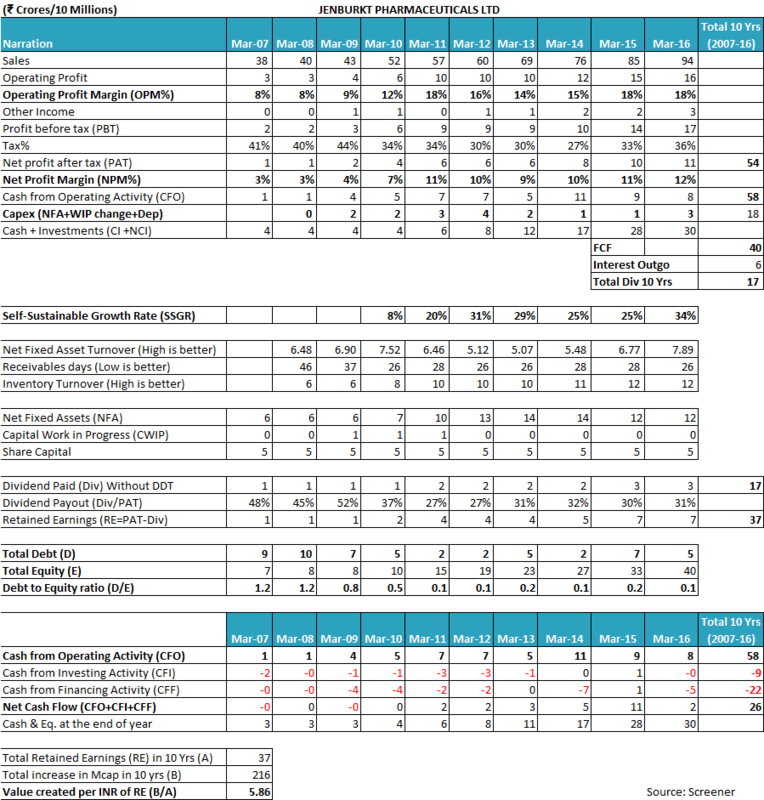 Overall, Jenburkt Pharma seems to be a company growing at a moderate pace with improving profitability year on year. The company has been able to manage its asset utilization, working capital management in a very good manner and therefore, it has been able to generate very good amount of cash flows, which have led to a reduction in debt, payment of dividends and generation of good amount cash reserves with the company. However, the company has very high employee costs when compared to its similarly placed peers. The remuneration of the promoter/CMD as well as his commission arrangements with the company are at a higher level than the normal industry levels. The investor should focus on the aspects of sourcing of finished goods, get clarifications about the data issues in the annual report as well as the property being taken on rent from related parties before she makes any final opinion about Jenburkt Pharma. These are my views about Jenburkt Pharma. 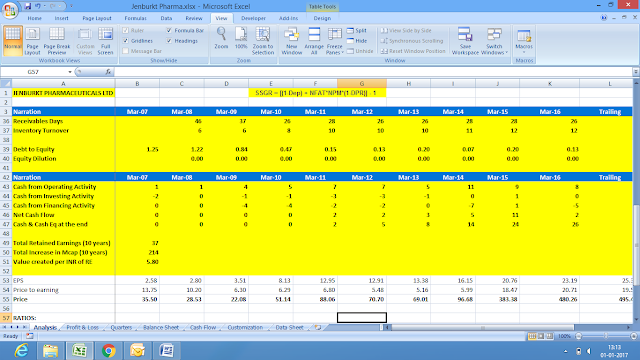 However, you should do your own analysis before taking any investment related decision about Jenburkt Pharma. An investor should keep a close watch on the profitability margins and receivables position of Jenburkt Pharma in future.